To continue fun with FusionIO cards, I wanted to check how MySQL / InnoDB performs here. For benchmark I took MySQL 5.1.42 with built-in InnoDB, InnoDB-plugin 1.0.6, and XtraDB 1.0.6-9 ( InnoDB with Percona patches). As benchmark engine I used tpcc-mysql with 1000 warehouses ( which gives around 90GB of data + indexes) on my workhourse Dell PowerEdge R900 ( details about box ). Full results I put on page https://www.percona.com/docs/wiki/benchmark:fusionio:mysql:start, here are my thoughts and interesting facts. which as we saw ( https://www.percona.com/blog/2010/01/11/fusionio-320gb-mlc-benchmarks/ ) is necessary to get most throughput from FusionIO. 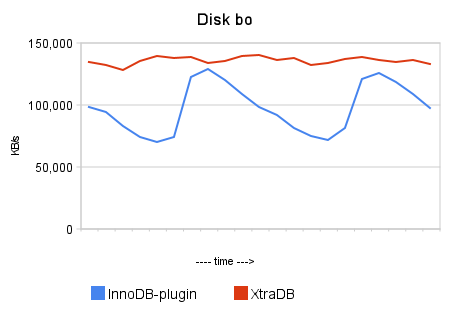 Also you may see from graph some waves for InnoDB-plugin. Here we observe innodb_adaptive_flushing in action (which is ON by default), and I think innodb_adaptive_flushing in InnoDB-plugin is not quite balanced, it may do overaggressive flushing, when it is not necessary. But looking on CPU stats (see graph later), I guess InnoDB-plugin spends most time in buffer_pool mutex, contention here is not fully resolved yet in InnoDB-plugin. Now, let’s take XtraDB. In additional to multiple IO threads, we have patch to decrease contention on buffer_pool mutex, plus separate purge thread. Also we use different adaptive_checkpoint algorithm. 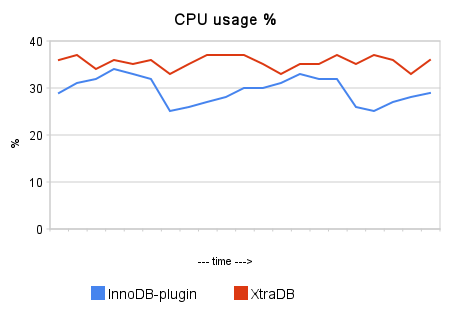 InnoDB-plugin is 1.6x times better InnoDB, and XtraDB is 1.7x times better InnoDB-plugin. Now on CPU usage and disk utilization. saw FusionIO can do much more) and with 45-50% of idle CPU. I assume we still see significant contentions inside XtraDB, and there big room for improvements. As for InnoDB-plugin, I’d wish InnoDB team makes some actions on buffer_pool mutex problem. It is not so bad, with final result 23038.283 NOTPM, it is only about 12% worse than with logs on separate partition. MySQL InnoDB/InnoDB-plugin/XtraDB is not fully able to utilize throughput of FusionIO. XtraDB is doing better job with internal contention, but much more can be done. Still you can have very impressive performance improvement in IO-intensive or IO-bound workloads. You may want to use InnoDB-plugin or XtraDB to get better results. It’s a difficult choices between XtraDB innodb & innodb plugin. Very interesting. Thanks for sharing this benchmark. Which I/O elevator did you use for the OS? Noop? tpcc-mysql shows the number of transactions processed every 10 seconds. in this case there is no scheduler settings for software RAID nor for FusionIO cards. Thank you, I fixed that. Do you think you would see any differences with the adaptive hash indexes disabled? disabling it does not help, as in this case, InnoDB has to do much more work on index pages scan. did you measure query latency? Throughput benchmarks look great, but the latency is crucial for web applications. We’re using XtraDB 7 with 40GB buffer pool, RAID10 with HDDs and when the write throughput goes up, we see read query latency dips in about 500-1500ms. What about the XtraDB RAID10 graph – the first part of the graph looks scary. Is there any explanation for that. Unfortunately latency report from tpcc-mysql benchmark is rather limited, we may fix that one day. the response time grow exponentially on increasing throughput. from 0 point of time (from restart of mysqld), and for RAID10 HDD it takes much longer to fill buffer_pool. I know, but I expected the graph to be much more linear. From this graph it seems the throughput touches zero all the time, until some volume of data gets to the buffer pool. I’ve actually found xtradb SLOWER than innodb on my own benchmarks. I wonder if I’ve missed something with configuring Percona server? In this case, percona server takes more time than MySQL server. Is there any problem in my load test?